It is easy to crochet butterfly stitch, a stitch pattern that develops across multiple rows using just a simple combination of basic crochet stitches and chains. It is a really fun stitch pattern to practice, but many people aren't quite sure how to use this stitch in projects. These 20 crochet patterns will inspire you with their variety of uses of the butterfly stitch in crochet. The majority of these crochet patterns, about half of which are free crochet patterns, feature the butterfly stitch in its traditional form. This is a series of chains across three or four rows that are joined together in the center with a single crochet stitch. We see how it can be used to add pop and flair to hats, gloves and other accessories as well as clothing and even blanket squares. The rest of these crochet patterns showcase variations on the classic butterfly stitch. These are from designers who have made their own adaptations to the popular stitch, changing up the chains or shaping to get a similar - but different - effect. It is so fun to see how many different ways there are to create crochet butterflies. One of the best ways to use the crochet butterfly stitch is as a decorative bow detail in a project that otherwise consists of really basic crochet stitches and shaping. In fact, some people have even called this stitch the "bow stitch" because it looks as much like a bow as it does a butterfly. We see a terrific example of this in the free crochet hat pattern by Vallie's Kids where the butterfly looks like a bow built right into the side of the hat. It's a very cute design idea and one that could be adapted to many other simple crochet hat patterns once you understand the basics of how to do it. Just Be Happy's crochet hat pattern has a similar detail to what we saw above with the Vallie's Kids free crochet pattern, but the bow is elongated a bit and accessorized in the center. The crochet stitches on the hat also differ, creating a complete different hat style even though the basic concept is the same. Isn't it amazing how many things we can do in crochet with the same basic skills?! Hopeful Honey has also incorporated the butterfly stitch as a design detail in a free hat pattern. In this case, it is repeated so that there are two bows in the pattern, one sitting on top of the other. This gives us an idea of how rows of butterflies can look. Additionally, a pearl detail is added to the bow and we find a scallop at the edge of the hat itself, creating a particularly feminine and beautiful hat design. Crochet It Baby shows us yet another way to turn a hat into something special by incorporating the butterfly stitch into its design. Like with Hopeful Honey's pattern, this one has multiple butterflies. But in this case, they are not stacked atop one another; instead there are several butterflies floating around the entire circumference of the pattern. We get an idea now of different ways to stagger out the butterfly stitch in all different types of patterns so we achieve the look we are going for. This crochet pattern is sold through Craftsy. The crochet butterfly detail works for accessories other than hats, of course, which we see nicely here in the fingerless crochet gloves pattern from Suzie's Stuff. This is also a great example of how this unique stitch can work with other complex stitches like textured post stitches, rather than only looking good when made with simple, basic crochet stitches. It is most commonly used with simple stitches, especially the half double crochet stitch, but you don't have to limit yourself if you are familiar with the more advanced stitches; have fun making butterflies in everything you craft! Just like we saw with hats, one butterfly stitch is a great design detail on each fingerless glove but you can also repeat the stitch for a different style. Here we have multiple butterflies stacked on top of one another on one side of the glove. This crochet pattern by designer Amy Maxwell is available for sale through her Ravelry store. It's a perfect spring crochet pattern. The wristlets shown above also have a matching scarf pattern from the same designer. They are both named "spring butterfly" because they use the crochet butterfly stitch but also because the lacy openness of the design makes these accessories a terrific layering option for springtime. This pattern is also for sale in the designer's Ravelry store. Use it to make gifts; the stitch looks complex and will impress your gift recipients but is actually easy to work as you'll quickly learn when working with all of these patterns. You can make a variety of different matching sets using the four crochet patterns for sale from Gramma Beans on Craftsy. There are two patterns for headbands (in different sizes), one beanie pattern (sized newborn to adult) and a scarf pattern. All of the patterns use the crochet butterfly stitch as the main detail on the piece. The scarf can be paired with any of the other items for a stylish look or a great gift set. In addition to the matching set shown above, Gramma Beans separately sells the crochet pattern for a beautiful capelet that also matches the items in the set. The staggered placement of the crochet butterfly stitch makes this a beautiful accessory. The pattern has sizes for toddlers all the way through adult. Pookie Doodle Crafts has a tutorial for the butterfly stitch that includes video instructions. This crafter shows how to turn the stitch into a square, whether you want to work it on all four sides or just right in the center. These crochet squares could be used for a wide range of different types of projects, not the least of which would be afghans. Christie's Closet Creations over at Craftsy adapted the crochet butterfly stitch into a dress shape. This crochet pattern is for girls around the age of 18 months. Crafters with advanced level skills would be able to adapt the pattern to smaller or larger sizes. This crochet cowl pattern utilizes the butterfly stitch as a bow detail in a similar way to many of the hat and scarf designs that we have seen. However, designer of Handmade Crochet by Me on Craftsy also shows how it can look extra special with a fringe detail. Additionally, this one is worked in the back loop only for a ribbed variation on the basic crochet stitches. This crochet hat pattern showcases a variation on the traditional butterfly stitch, so it offers a nice opportunity to practice something a little bit different while achieving a similar effect. 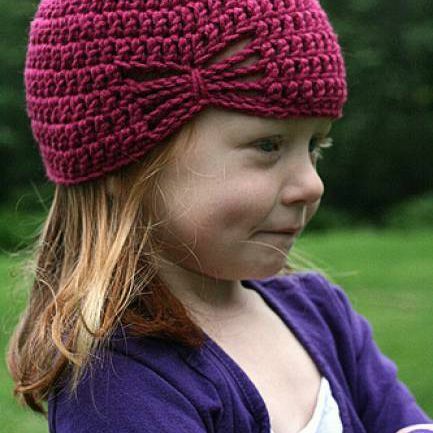 This hat pattern is sold on Craftsy from Stitches by Sam. Here we see another variation on the crochet butterfly stitch. This simple choker pattern is all about the stitch detail! It is available for sale on Craftsy from Chrystaldesign. This is yet another variation on the simple butterfly stitch. There are so many different ways to change up the design just slightly for different effects. These gloves use additional chains for more unique butterflies. The pattern is sold on Craftsy by November Rose Designs. If you are ready to try out a variation on crochet butterfly stitch in a more complex pattern then this matching set of adorable dress and knee socks is a terrific choice. The link above takes you to where you can purchase the pattern on Craftsy for the socks. The crochet dress pattern is sold separately by designer Miak Design. Crochet butterfly stitch is a terrific choice for a crochet prayer shawl, an item that is meant to inspire the recipient with the love and intentional messages crafted into it. After all, butterflies symbolize hope and transformation. This is a free pattern by by njSharon AND DebiAdams on Ravelry. This free crochet blanket pattern is worked in the round. It begins with a detailed crochet flower design. As the blanket expands, the crochet butterfly stitch is added to bring butterflies to the garden. This pattern is by Erin Davison on Ravelry. A vertically elongated variation on crochet butterfly stitch serves as the central detail of this crochet halter top. This top works as a swimsuit top and is also perfect for music festivals. Wear it over a tank top if you're more modest. Find it on Ravelry by designer Matinee Maya Imchum. The variation on the crochet butterfly stitch in this pattern is a bit narrower and longer than what we normally see. 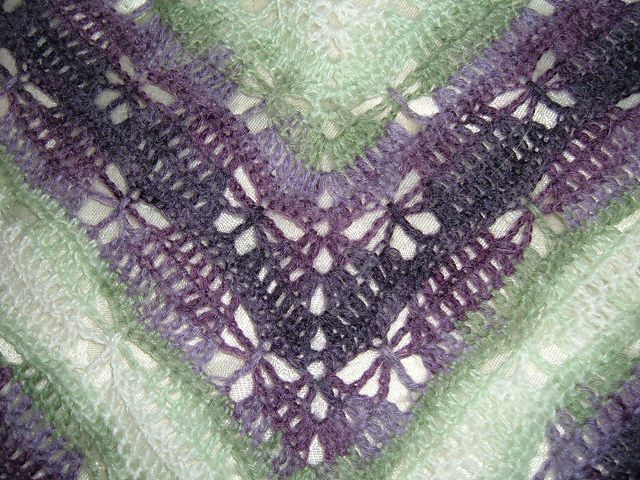 This is a rectangular lace weight crochet shawl worked in three colors with the butterflies distributed evenly across each color stripe. It is designed by Esther Dijkstra on Ravelry.